Rivelets of deep, clear greens play through opaque, sandy glass in these scrumptious earrings. The borosilicate glass lampwork beads are topped with highly detailed, sterling silver beadcaps. 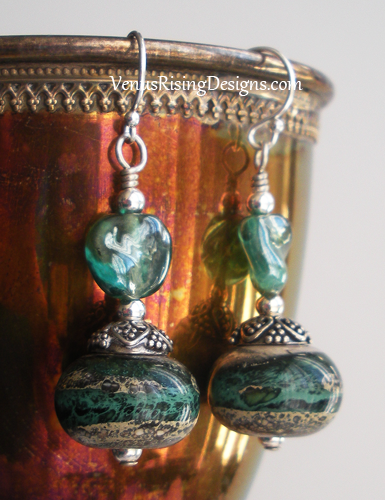 The swirly, opalescent green glass lentil beads add to the watery feel. Sterling silver beads, wire and findings; wire wrapped. About 1-5/8"